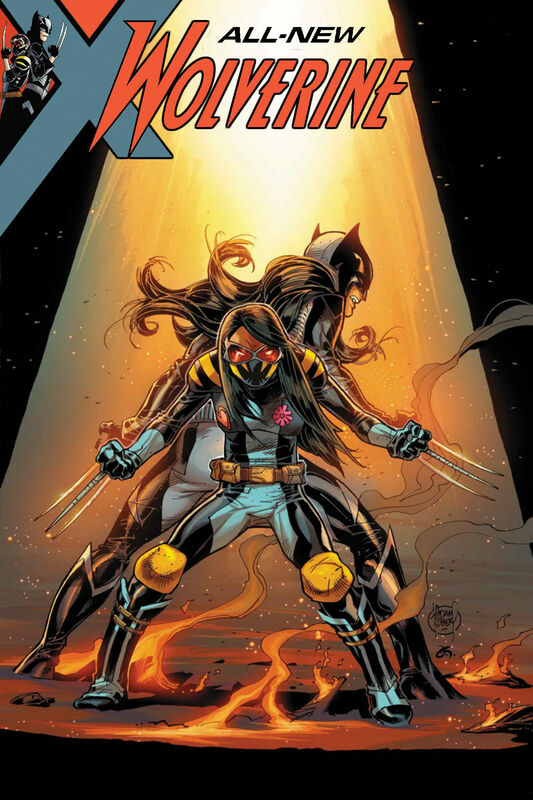 All-New Wolverine, Laura Kinney started life as an experiment labeled X-23. The 23rd attempt to clone Wolverine from a damaged sample. All of the other samples failed but Laura’s sample is successful when combined with another “X” chromosome and as punishment her creator Dr. Sarah Kinney is made to carry the embryo and deliver her. Once she turned seven Laura was subjected to radiation poisoning to kickstart her X-Gene, her claws removed, coated with adamantium and replaced in her hands and feet. 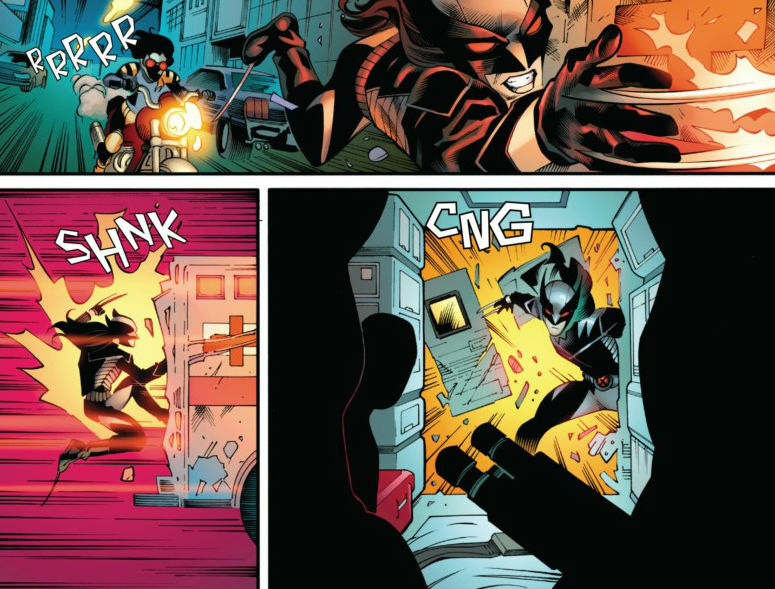 She was then trained to be an assassin and subject to a “trigger scent” that will send her into a murderous rage. With help of Logan, Laura starts to acclimate to the real world and enrolled in the Xavier Institute. Laura and Logan bond and form a father and daughter relationship. 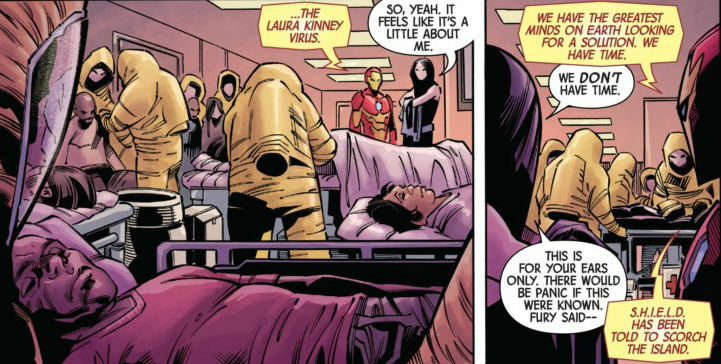 When Logan dies, Laura assumes the mantle of the All-New Wolverine to honor his memory. Recently she has found that she herself had been cloned and upon liberating them, she has taken in her young pre-teen clone training Gabby as Logan did her. After a run in with Kimura, Laura finally breaks free of the trigger scent and is finally free. When an alien ship crashes on Roosevelt Island the lone occupant, a young alien girl emerges and before dying in Laura’s arms says her name. The young alien died from a highly contagious disease that leads S.H.I.E.L.D. to cutting Roosevelt Island off from everything with a small window to find a cure Laura and Ironheart must find out who the alien is, where she came from, and how to save everyone on the island before S.H.I.E.L.D. burns the island and everyone on it to save the planet. Plot: Laura and Ironheart consult some of the most intelligent people on the planet to find a cure for the disease, but the big breakthrough emerges when rogue A.I.M. agents take the body of the alien. Story: This story was awesome. I loved how fast-paced it was. 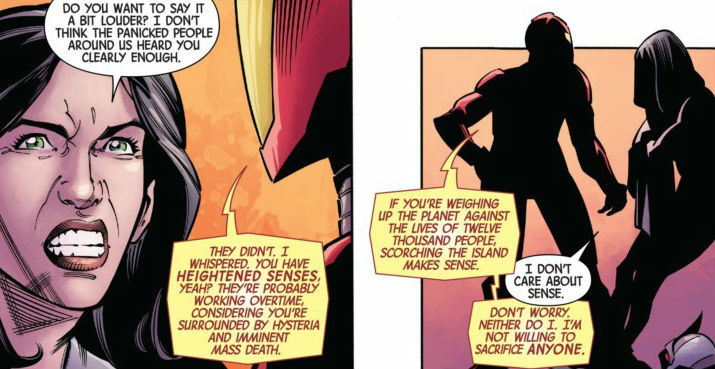 This could have easily been stretched out over two issues, but was perfectly done here. Tom Taylor moves this story in such a fast pace that you feel like you are watching a summer action thriller. The stakes keep getting higher, and the pressure rises but that does not deter from the character moments here. Taylor brings in some of the smartest people in the world via webcams and gets each one perfectly. But I have to say Gabby has stolen the issue. Her moments here are just nothing short of scene stealing at its finest. When Gabby is on the page you can not help but wonder what she will do or say next, and Taylor never disappoints, but at the same time never takes the attention from Laura or the main story. We have this scientist who is a part of some rogue A.I.M. scientists who is infected and been using stimulants to stay functional. She is the first one to think outside of the box, with Laura’s regenerative powers, but instead asks why is her body still fighting it? 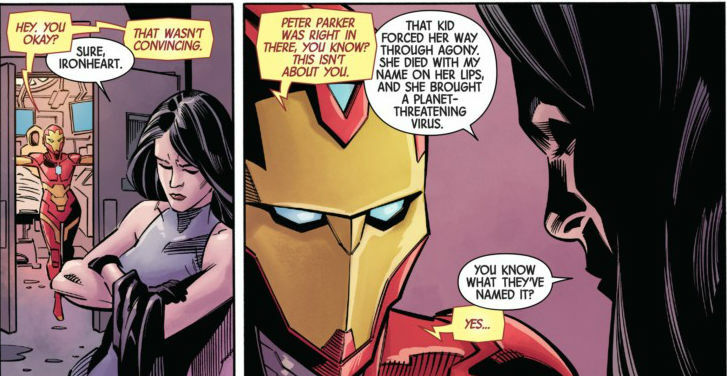 This was a great twist, usually with someone with these powers we have their blood being used to cure the disease, we been there, done that but Taylor instead throws us through a loop as reveals that the disease is actually attracted to Laura, it leaves the bodies of the infected and goes to her where her body as Gabby says punches it in the face. This is just an awesome twist, something I was not expecting. Art: I have been a longtime fan of Leonard Kirk, and this book just shows me why. As time goes on some artists lose focus, they tend to get less detailed, but Kirk manages to still grow as an artist. Each time I see his work I find new nuances in it, that he didn‘t previously have and that shows his passion to the medium. This issue features a three inkers and two colorists, but the team unites in one single style that compliments the other and make it hard to see where one ends and the next begins. This provides us with a nice clean look and feel to the book. 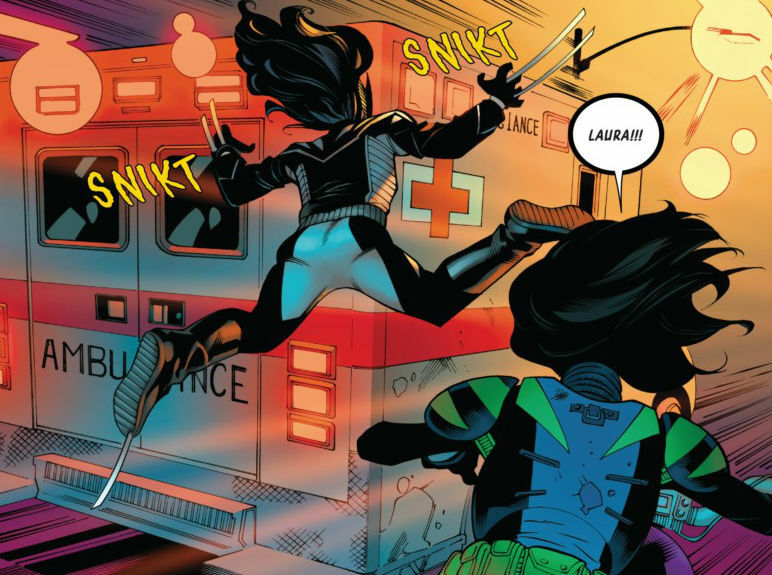 Verdict: Overall this was another amazing issue of All-New Wolverine and I can not wait to read even more of this story, because I know I have no idea where Taylor is going but I do know I will enjoy the ride. Even something as simple as a costume change Taylor manages to use symbolically to show that Laura is more than just the killing machine she was designed to be. Guardians Of The Galaxy Vol 2 Discussion! 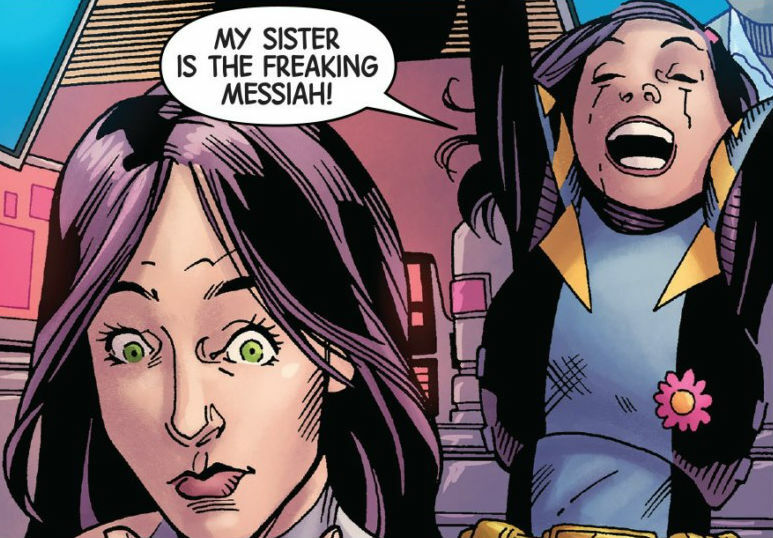 Correction: Laura was created by duplicating the X chromosome. Had they used a Y chromosome she would have been a male. Also, she’s specifically the 23rd attempt at a FEMALE clone (this is confirmed by Craig Kyle). There were numerous failed attempts at the male before that.